"I wanted to understand how I could help. It's a career that is challenging, interesting and makes a difference in peoples' lives on a daily basis." Narenza graduated from this course in 2009. Attending an open day cemented Narenza's decision to study nursing at LSBU, as well as its excellent reputation and the location of the campus meant there was so much to do. Narenza's experience at LSBU changed her life – as she worked her way through the programme, the support she received from her lecturers and fellow students gave her the confidence to aim higher. I enjoyed all my topics, particularly in the first year. All branches of nursing were linked together, which allowed us to get together and support each other. She even found time to get involved in Open Days and fundraising for LSBU. In her second year, Narenza received a scholarship, The Lawrence Burrow Educational Trust award, and was commended for her determination and enthusiasm to inspire others. Because building practical skills is such a vital part of any nursing course, Narenza spent fifty percent of her time on placement. LSBU works closely with NHS Foundation Trusts, organising a wide variety of placements. Narenza was placed at the North East London Foundation Trust, where she worked on rotation, gaining experience in substance misuse, elderly, child and adolescent mental health nursing, as well as acute inpatient and community care. All my placements were well organised, and I was able to work in all areas of mental health, with guided supervision from my mentors, who I am still in touch with today. On graduation, Narenza was offered a permanent role at her last placement with the Waltham Forest Community Drug and Alcohol Team as a Senior Substance Misuse Nurse. She's passionate about passing on her knowledge too, and has mentored student nurses, as well as lecturing on substance misuse back at LSBU. LSBU has instilled a spirit of lifelong learning in Narenza as she forges ahead in her career, knowing that it can expand your future options. She's currently with LSBU at Southwark, studying for a GradCert in Non-Medical Prescribing. 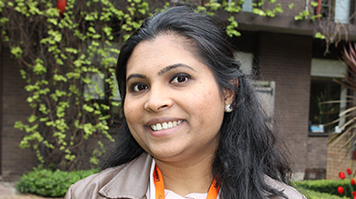 Narenza knows she made the right decision in choosing a career as a Mental Health nurse. Nursing is hard work. However, nothing gives you a better feeling than being able to see a person who was seriously ill, leave hospital a lot healthier and go home.